Experience the future of driving via an astonishing daylight-like visibility thanks to BlingLights BL-300w light technology. 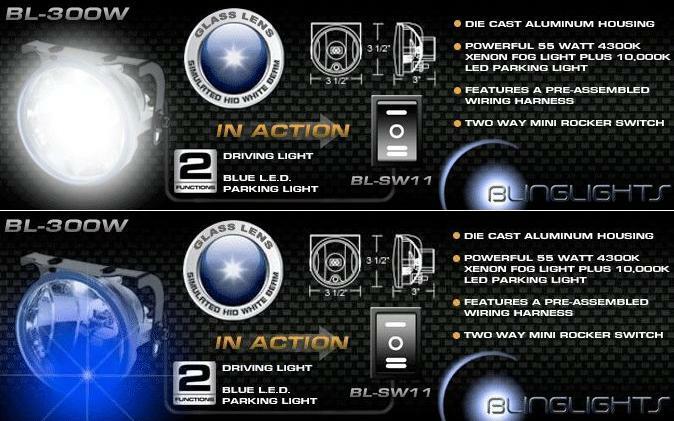 Featuring a fog and driving, light-on-road pattern fused with high-visibility blue accent lights, BL-300w xenon lamps can be easily seen in virtually any light including direct sunlight. You can also adjust the light for a unique experience. Designed to imitate the appearance of ordinary dealership fog lamps, BL-300w lamps light like original fog lamps and is compatible with the factory wiring and or light controls. In addition to increased visibility, BL-300w includes everything needed to install, BlingLights’ BL-300w fog and driving lamp kit includes BLSW11, a 3-function switch that blends cleanly into any flat surface within reach or out of sight. Does the kit include everything I need? Yes, the kit includes 2 lamp enclosures for both sides, powerful H3-55 watt 4100K bulbs, 10,000K LED bulbs, adjustable mounting hardware, complete wiring kit with relay and fuse, switch, photo installation directions, free phone and email support and 1 year warranty. Click the button below to add the 2012 2013 2014 Honda Pilot Xenon Fog Lamps Driving Lights Foglamps Foglights Kit to your wish list.